There are two dog sledding trails in Algonquin Park — the most popular is located along Highway 60 while the second is located in the northwest corner of the Park. Park permits are required for the use of these trails and backcountry rules apply. Algonquin Park does not offer guided dog sledding opportunities. This service is provided by commercial operators located outside Algonquin Park, who use Algonquin Park’s trail systems. visitors skijoring with dogs must follow regulations for pets in provincial parks. The Sunday Lake Dog Sled Trail is Algonquin Park’s most popular dog sledding trail offering kilometres of mushing through mixed and hardwood forest habitats. This packed route offers spectacular scenery and avoids ice travel. On Highway 60, access is from the Trailer Sanitary Station Parking Lot at km 35.6. Click the image below to download the latest Sunday Lake Dog Sled Trail Map as a PDF easily opened with Adobe Acrobat or similar. 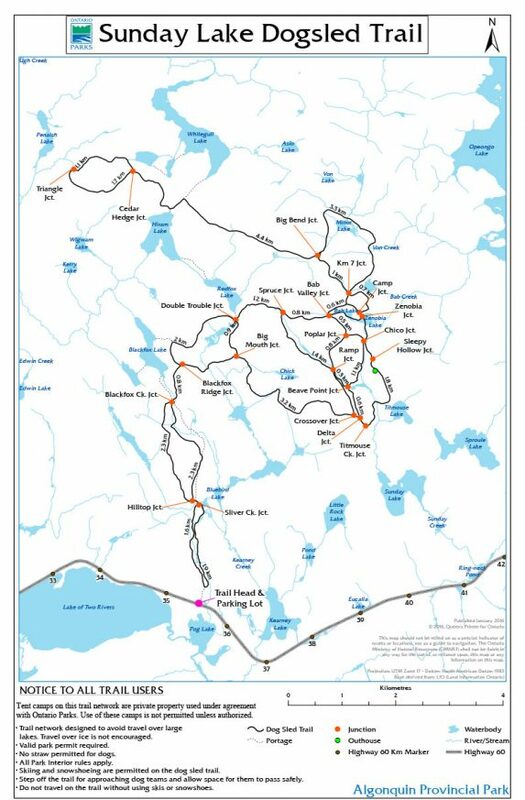 The North Algonquin Dog Sled Trail, located in the northwest corner of Algonquin Park, is operated under agreement between Ontario Parks and a private dog sled operator. For more information contact Algonquin Park Information.